Get ready to seize the day! After the spectacular success of American Idiot and A Christmas Carol, Globe Live is again partnering with 9 Works Theatrical to bring Disney’s Broadway classic Newsies to the Philippines. 1. Newsies, is loosely based on the real-life 1899 newsboy strike in New York City, where a group of boys initiated a strike hoping to improve how the child labor force of newspaper hawkers were compensated. 2. Disney adapted the story into a musical film in 1992, the music of which was led by noted composer and pianist Alan Menken. Menken is the decorated composer responsible for the scores of The Little Mermaid, Beauty and the Beast, Aladdin, Pocahontas, The Hunchback of Notre Dame, Hercules, Tangled and many more including A Christmas Carol, which Globe Live staged last December 2016. Collaborating with Menken on the songs for Newsies was lyricist Jack Feldman, who also worked on other Disney movies such as Oliver & Company and The Lion King II: Simba’s Pride. 4. 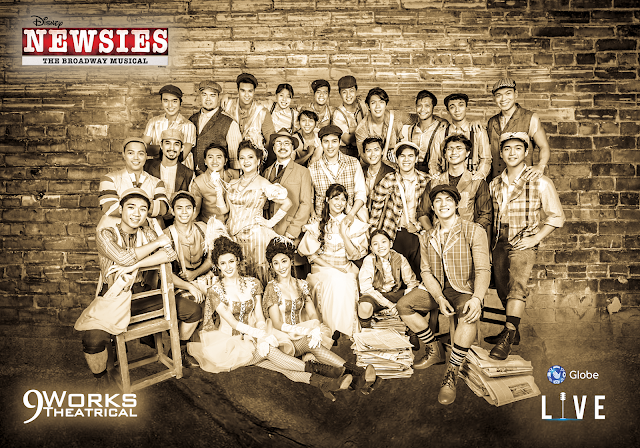 The book used for Disney’s Newsies stage adaptation was written by four time Tony award winner Harvey Fierstein, an American actor, playwright and voice actor. To date, he is one of three men tied at having the most number of Tony Awards in different categories. 5. The film starred Christian Bale as Jack Kelly, with first-time film director Kenny Ortega, who achieved fame for choreographing the concerts of Cher, Gloria Estefan, and Michael Jackson, and films like Xanadu, Pretty in Pink, Ferris Bueller’s Day Off, and Dirty Dancing. He would later direct films like Hocus Pocus and High School Musical. 6. The film gained cult status when it was released on home video. Fans of the film (and later, the Broadway musical) are called Fansies. 7. Newsies was adapted to the stage in 2011, and premiered on Broadway in 2012. 8. Jeremy Jordan who played Jack Kelly, the lead character in the Broadway show also portrayed lead roles in TV shows like Smash and Supergirl. 9. Newsies the musical was nominated for eight Tony Awards in 2012, winning Best Choreography and Best Original Score. 10. The musical had a two-year run on Broadway, playing 1,005 performances. 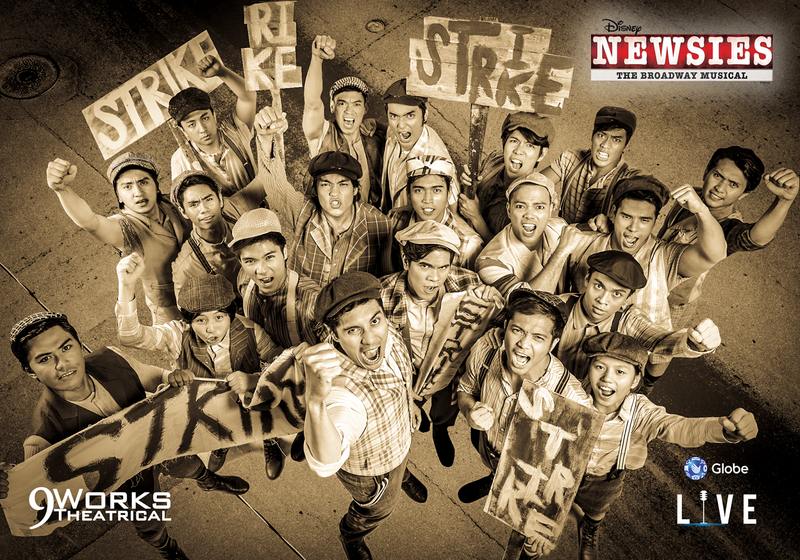 Disney’s Newsies will be staged in the Philippines at the Globe Iconic Amphitheater, Bonifacio Global City, Taguig from July 7 until July 30. 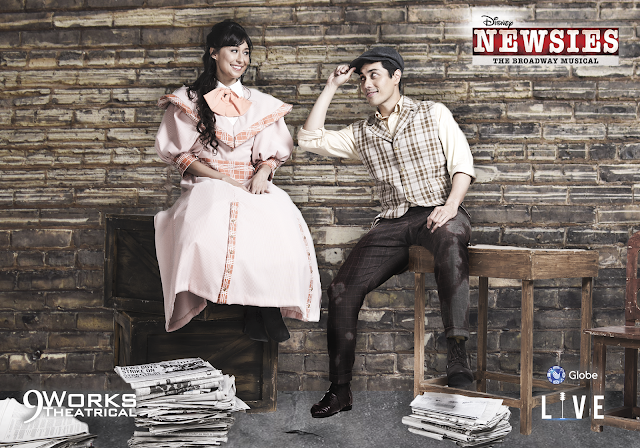 For more information, visit the website at http://go.globe.com.ph/newsies.html. Tickets are available now at https://www.ticketworld.com.ph. Sarah G’s #87000 Facebook Live Performance.